Don’t miss the largest annual education seminar for asset management professionals! 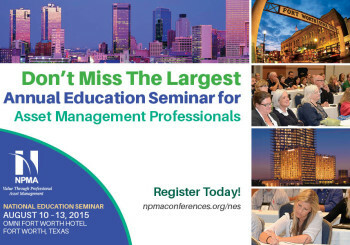 Attend the National Property Management Association’s 2015 National Education Seminar (NES), August 10-13, 2015, at the Omni Fort Worth in Fort Worth, Texas, to learn actionable solutions to manage, control and protect assets while you build your professional network! Earn up to 4 CEUs in your choice of over 60 sessions and panels packed with first-hand experiences, case studies and practical “how-to” content. Build your personal and professional networks through Special Interest Group (SIG) and chapter meetings, receptions and fun. Visit the Exhibit Hall to meet product and solution partners who can help you solve your specific challenges. Participate in Pre-Conference Certification Courses, including review sessions and testing for CPPS, CPPA or CPPM levels. An exclusive rate for 2015 NES attendees is available at the host hotel, the Omni Fort Worth, through July 20. Learn more and register for the 2015 NES today at www.npmaconferences.org/nes!